"Even as their companies fail, Ford and GM CEOs continue lavish lifestyles: The CEOs of the big three automakers flew to the nation's capital yesterday in private luxurious jets to make their case to Washington that the auto industry is running out of cash and needs $25 billion in taxpayer money to avoid bankruptcy. The CEOs may have told Congress that they will likely go out of business without a bailout yet that has not stopped them from traveling in style, not even First Class is good enough." "Ford Motor Co. President and CEO Alan Mulally received compensation valued at $22.8 million in 2007, down nearly 42 percent from the prior year, when he joined the company and collected a hefty signing bonus." When you think of CEOs as all being greedy, overpaid country club types, you cannot place Costco CEO Jim Sinegal into that group. Sinegal is well known for running a tight ship, including his own $350,000 annual salary. Yes, he does fly in a corporate jet, but with the money saved by Sinegal not demanding an eight-figure salary, the company could buy and fly his jet and still make out far ahead of the car makers. If you compare Sinegal's salary to that of Ford's Mulally, Costco saves $22,450,000 a year, enough to buy 5.6 brand new Pilatus PC-12NG luxury turboprops. Pilots and aviation watchers have always known that the PC-12 is a very efficient and capable executive aircraft with direct operating costs far less than any business jets that carry an equal amount of souls. Yes, it flies a touch slower, and might not have all the ramp appeal of a G550, but for the mission of hauling Big Auto's CEOs to Washington to beg for money, the Pilatus can handle that trip perfectly. I fail to understand why more big corporations don't use the PC-12 as their chosen mode of executive transportation. Not only can the Pilatus haul a load of suits to the Annual Meeting, but after that meeting, it can drop that same group into a tiny grass strip two miles from seriously awesome trout fishing, or depart from a tiny municipal field minutes from a ski resort high up in the Rockies. Will fatcat honchos give up their golden toilets and near mach speeds for a...turboprop? Most likely they will not, unless forced to by the masses, the bankruptcy court, or Nancy Pelosi. 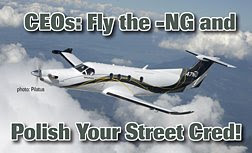 Yes, they might lose some street cred down at the country club with their cronies, but in the real world where the rest of us live, making that decision to fly -NGs would be viewed by stockholders and the public as a major cost savings. And since image is everything to these people, maybe having the image that you want to run a lean, mean company right now would be a very, very good thing. But that would only matter if the CEOs cared what we – their customers – really thought. For years now, the "Big Three" have sold obsolete gas-guzzling giant SUVs and trucks to anyone with shaky credit that could sign their name, without thinking at all about the environment or their company's financial future. They did it because there was more profit in Durangos, Expeditions or Escalades then there would be in the smaller, more fuel-efficient hybrid vehicles that people actually want to buy today. Until they can be smart about what they build, I say let them declare bankruptcy and wallow around at the bottom of the corporate food chain for a while. Maybe then they'll think of something other then fat CEO pay and profits.